COLUMBUS, Ohio -- Authorities investigating the slayings of eight family members in southern Ohio have no new information to indicate whether there's an ongoing threat to the victims' relatives, the state's attorney general said Monday. The eight Rhoden family members were found shot in the head on April 22 at four homes near Piketon, about 80 miles east of Cincinnati. Authorities say the deaths were a "sophisticated operation," but they haven't released any specifics on suspects or a motive. In the days after the slayings, Pike County Sheriff Charles Reader said that it was clear the family was targeted and that he had told the victims' relatives to arm themselves. On Monday, Attorney General Mike DeWine said authorities didn't know whether there was a threat to the family and he would not speculate about whether a threat remains. "We have no new information that would indicate that there is a threat to any of the members of the family," DeWine told The Associated Press in an interview before speaking at an opiate-related conference in Columbus. "We don't have any information on that. And we did not when we initially said it other than the fact we had eight people killed." Services have been held for two victims. Funerals for the other six are set for Tuesday. 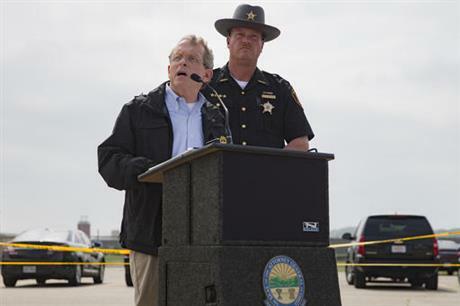 DeWine said "ample security" will be present at the services. DeWine's office said agents worked through the weekend on the investigation. So far, more than 100 pieces of evidence are at the state crime lab. Investigators have received 450 tips and conducted 128 interviews and contacts. DeWine said some of those interviews could be repeats. The victims are 40-year-old Christopher Rhoden Sr.; his ex-wife, 37-year-old Dana Rhoden; their three children, 16-year-old Christopher Rhoden Jr., 19-year-old Hanna Rhoden and 20-year-old Clarence "Frankie" Rhoden; Christopher Rhoden Sr.'s brother, 44-year-old Kenneth Rhoden; their cousin, 38-year-old Gary Rhoden, and 20-year-old Hannah Gilley, whose 6-month-old son with Frankie was unharmed. Two other children, Hanna Rhoden's 4-day-old daughter and Frankie Rhoden's 3-year-old son, also were unharmed.